People that live outside the US (like me) might like to know how to make it work on their phone. 1. Get a US billing adress and creditcard. If you don’t have that you should generate the info from a site like this: Fake Name Generator. 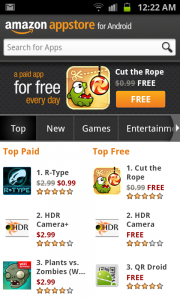 Keep in mind though that you won’t be able to buy anything with it, but you can download the free apps of the day. [Update] Just verified with two new created amazon user accounts. It looks like many people are generating fake credit cards and bill address using http://www.fakenamegenerator.com/ that caused it be blocked by Amazon. But when I generate credit card with another tool, it works fine. I will publish thi tool to Market Unlocker Pro users. Drop me an email if you need a fake credit card and billing address. 2. Set up a new account with that info on amazon.com If it complains that you’re not from that region, which it will likely do, use a proxy in browser to make it work. To download this app you need to visit this link – amazon.com/appstorelanding from your mobile’s browser which will directly start downloading the application’s apk file onto your phone. Next the application would be installed onto your phone. You will have to signin to your Amazon account if you already have. follow this once you have logged into your account you can find all the apps listed in a very good interface. b. Click “Fetch USA Proxy (pro version) if you’re using pro version, or set up an USA proxy manually. c. Check “Enable Proxy” to ON, a notification will display on status bar saying proxy is running. 6. Re-open Amazon appstore and enjoy your free apps!!!! 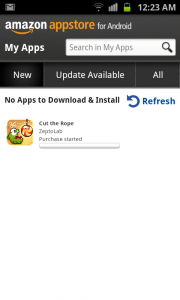 You can click on the ‘Paid app a day’ free option and then download / install the listed application for free of cost. You need to tap on the ‘FREE’ button for this and following this it would be purchased / verified and downloaded to your device for free. If you are still unable to get daily free of paid app download, you can set proxy in your browser and download it from web. After successfully authenticated, it will be pushed to phone automatically. Just verified with two new created amazon user accounts. It looks like many people are generating fake credit cards and bill address using http://www.fakenamegenerator.com/ that caused it be blocked by Amazon. But when I generate credit card with another tool, it works fine. I will publish thi tool to pro version users. Drop me an email if you need a fake credit card and billing address. yes, please chekc your email. I have a pro version. Would you please give me one? Did you manage to get it work? Hi! I havo pro version, can you send me too? Hi I also a Pro user, can you send me too ? Hi i am pro user，can u send me one too?thx. Hello, sent you an email. please reply with your payment account. Thanks. Pro user here, may i have the info? Me to please pro user. yes, i sent it to your email. I have the pro version as well but can’t get this to work with the amazon appstore. If you have a real/working usa credit card and also living in usa, you do not need the app. Otherwise you can download paid app (daily) for free using fake card and the app. i am a paid pro user too, i need that thing too, please. Hi,i am a paid user, can i have the registration info? please send me the payment account (checkout or paypal). thanks. Pro user here, may i have the info?Sent by mail. sent. to access google books, proxy is necessary. Hi evan, could you please send me a valid credit card info? And the corresponding address, please. My account for pro version is wugaxp.AT.Gmail.com, (.AT. for @). Thank you. Could I get the credit card tool too? Can’t download via files in. I had an account for a year now but a few days ago I kept getting the not available in your region error. However, I can still purchase kindle books that are not in my region with my account. It is weird. I hope changing the address and cc will make everything work again. Thanks. 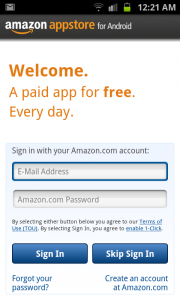 Why I cannot find the option “Involve Amazon Appstore” in proxy tab? I use Google Nexus 4 with android 4.2.2, but I modified the bulid version in “build.prop” to avoid be updated to 4.3.
what’s the version you’re using?